The coining of the term Sugar Code reflects the exceptional features of carbohydrates to build a large diversity of biologically relevant signals. Fittingly, a wide array of protein folds has evolved in phylogenesis with the ability to target distinct glycan determinants from the natural diversity. Being strategically presented at branch ends of the glycan chains of cellular glycoconjugates, substituted β-galactosides are key targets for lectin recognition. 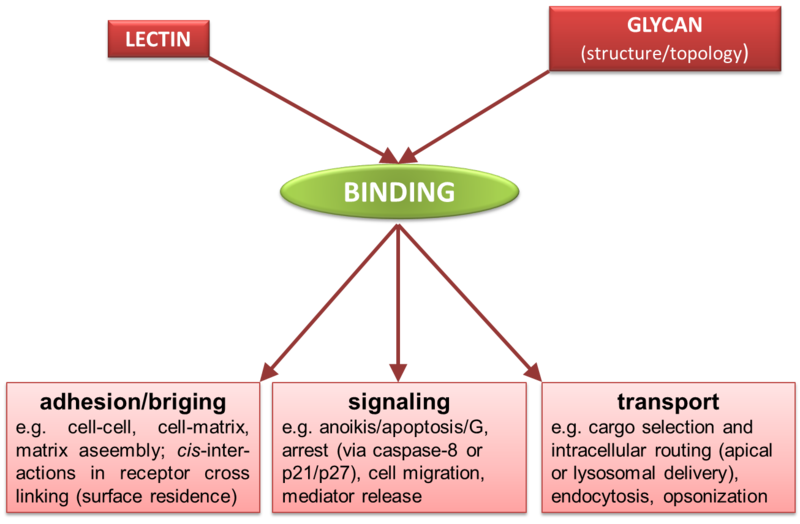 A family of endogenous lectins, the galectins, selectively targets such epitopes, thereby translating glycan signals into cellular responses with clinical relevance, with obvious potential for therapeutical exploitation. Development and testing of galectin-mimetic peptides with respective target selectivity. In parallel, development and validation of new diagnostic/prognostic tests, focused particularly on cancer and autoimmune diseases, is pursued. Side objectives of scientific/technological relevance are the development of new methodologies for drug screening and the design of tumour cell variants with tailored glycomic profiles. Effect of some human lectins on cell growth and morphology of human neuroblastome cells in culture . To develop selective galectin inhibitors, with focus on cancer-related human galectins. To develop high-affinity multivalent galectin-mimetics as potential therapeutically-active mini-lectins. To establish the molecular basis for ligand recognition by galectins and galectin-mimetics. To investigate the bioactivity profile of galectins and galectin-targeted compounds using different cell systems with normal and shifted glycomic profiles. To investigate the expression of galectins and galectin ligands in selected systems and clinical samples. To investigate the role and potential application of galectins/mimetics and galectin ligands in tissue engineering and control of wound repair. To identify biomarkers for routine diagnostic, particularly of cancer and autoimmune diseases, and to develop techniques and methodologies for their detection, analysis and diagnostic evaluation.